I’m just going to start off by saying that I am so not the kind of person who tries out for reality television.. I don’t even watch it! Yet somewhere out in the ether of the internet, there exists a photo (or possibly several) of me standing amongst a frenzied crowd in downtown Toronto before the crack of dawn, surrounded by people yelling and shoving self-promoting signs at a panning camera lens (I was not, for the record, one of those people). It all started with a nudge (okay, more like a heavy push) from a friend. Me? Masterchef? I would never do that. That’s just crazy. But that is exactly why I did it. Because over the past couple of months, I’ve come to realize that doing things just because they aren’t comfortable is not actually the way to be doing things at all. The quite opposite, in fact. To cut to the chase, I didn’t make the cut. And to be completely, utterly honest, I’m not the least bit disappointed. The point of this crazy little adventure was not to get on television at all, but to prove to my reserved, humble little self that saying “no” to something simply by proxy of it being scary gets me absolutely nowhere, but wholeheartedly embracing the weird and wonderful opportunities that come my way will ultimately make me a happier person. That’s what food is to me – a constant push and encouragement to be better, try harder and never doubt what I’m capable of. My relationship with food has taken me on an incredible journey – it’s shaped my career, my confidence and the way I see the day-to-day challenges. It’s made me lose my cool while [over]cooking 30 servings of basmati rice for a banquet class at George Brown, but it’s given me the gumption to stand in front of Masterchef judges and present them my dish without the slightest tingling of self-doubt. Food is so much more than what you put on a plate three times a day. It’s a language, an expression of who you are and what you stand for, and it teaches you lessons about yourself you never thought possible from a simple bag of cornmeal or a bowl of icing. Whether you’re crafting a simple grilled cheese sandwich or concocting a grand three-course meal, remember that every step you take in the kitchen is an expression of yourself. Make it count, take some risks and trust yourself. You never know where it will take you. 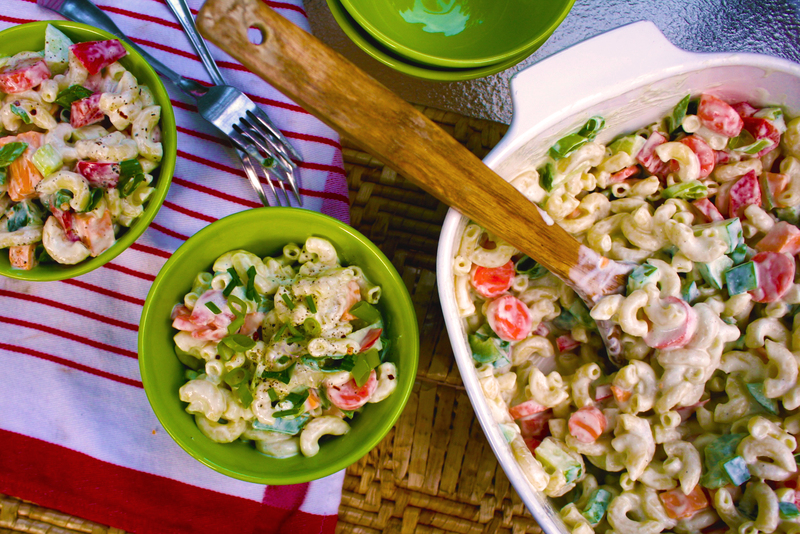 This recipe is my own version of my mom’s classic summer go-to side dish. The creamy combination of Greek yogurt, sour cream and buttermilk give this simple ranch-style dressing just the right amount of tang. 1. Cook macaroni according to package directions. Drain and rinse with cold water until cool. 2. Meanwhile, prepare buttermilk ranch: In a blender, combine Greek yogurt, sour cream, buttermilk, garlic, 1 tbsp chives and salt and pepper. Blend until smooth and well combined. Transfer to a bowl and fold in remaining 1/2 tbsp chives. Cover and refrigerate until needed. 3. 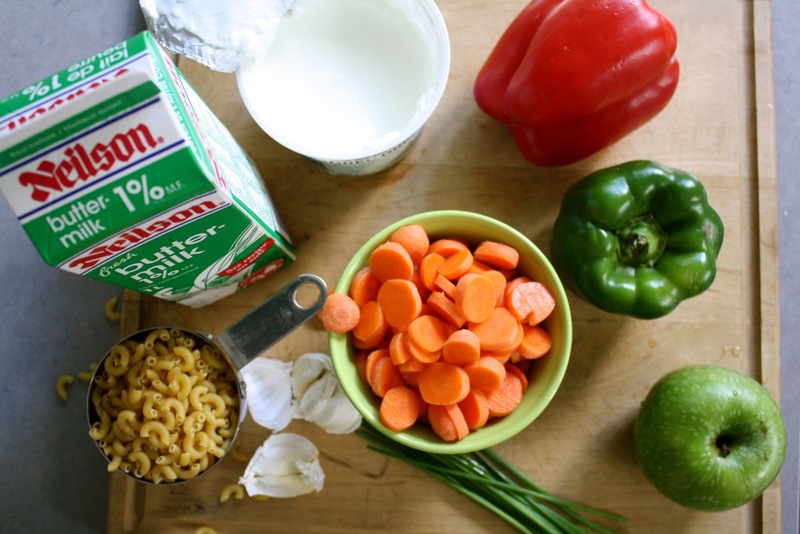 In a large casserole dish, combine macaroni, carrots, bell peppers, cheddar and apple. Stir in buttermilk ranch until fully combined. Cover and refrigerate until cold. 4. To serve, garnish with green onions.